One hundred and seventeen students were randomized to one of three groups: continued-incentive, discontinued-incentive, or control. For 12 weeks during the fall semester both the continued-incentive and discontinued-incentive groups received weekly incentives for using the university fitness center. At the conclusion of fall semester weekly incentive payouts ended for both incentive groups. 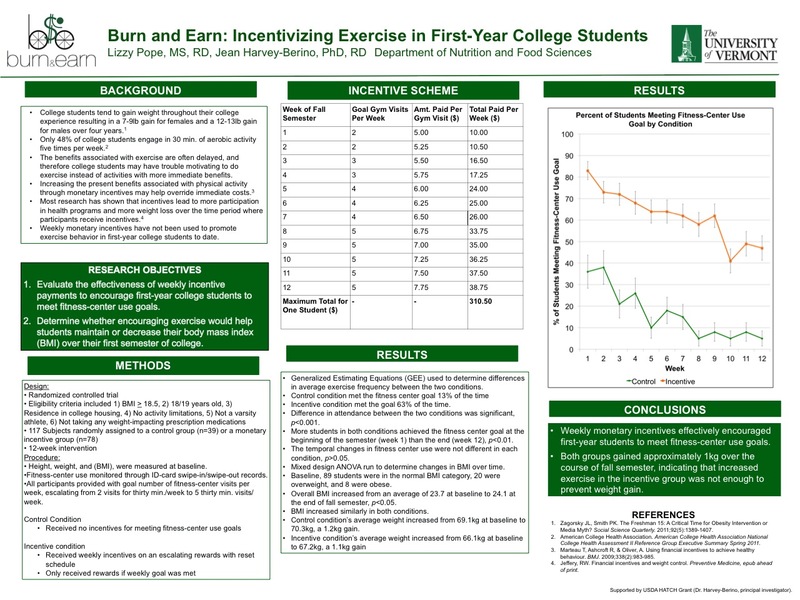 For 12 weeks during spring semester the discontinued-incentive group received no incentives to use the fitness center while the continued-incentive group received incentives on a variable-interval schedule, averaging one incentive payment each month. During the spring semester the exact schedule for the incentives was not known to participants in this group. Great. But how was she going to track the students? Well, perhaps she could set up some sort of card swipe system that would record the student ID, date, and entry/exit times for each visit to the fitness center. Great, how do you do that? Enter the Center for Teaching and Learning. Lizzie enlisted the aid of CTL staffer Wesley Wright. Together, Wesley and Lizzie assembled a Mac Mini computer and magnetic card reader. The Mac recorded each card swipe and entered the data into a central database. The database fed a web site, and the web site was used by the students to track their individual progress, using both tables and graphs. The web site also provided Lizzie with both individual and group statistics and the incentive payment owed to the students. 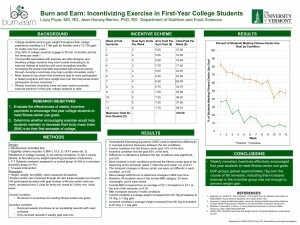 1 “Burn and Earn: Incentivizing Physical Activity in College Freshman – UNIVERSITY OF VERMONT”, n.d. http://www.reeis.usda.gov/web/crisprojectpages/0223043-burn-and-earn-incentivizing-physical-activity-in-college-freshman.html. This entry was posted in CTL Home Page, Grants & Awards, Learning, Technology, Tools and tagged databases, research. Bookmark the permalink.